Georgia Lucking-Germond, affectionately known as Miss G by her students was born March 21. She attributes her gift of music to the fact she was born the same day as Johann Sebastian Bach. Germond is an American pianist, composer, arranger, author, teacher, activist and entrepreneur. As a child musical prodigy, starting at age 4, Georgia has shown a high degree of talented professionalism in everything she has done. Her musical career started at the age of 16, teaching beginner students piano and organ. Germond’s professionalism, love of music, in-depth understanding of children and teaching methods, shows in every facet of her career. Music has always been an integral part of Germond’s life. She was born in York, Pennsylvania. At the age of four, she would return from Sunday school and play each song that she heard. She began private piano lessons, but soon clashed with her first teacher on artistic principles. Briefly stated: her teacher wanted her to play the music exactly as written, whereas Germond preferred to improvise. Her next teacher, however, was blessed with a similar ear for music as Germond’s, and from that point on her progress soared. Her new teacher incorporated music theory with her studies so that she not only knew how to play, but also understood what she was playing. She calls her music her savior and is thankful that it made her the successful person she is today. Germond’s passion for music continued to grow, and in the face of adversity she discovered the “power of one song”. Georgia had a sister named Lore who walked into the hospital to have her first baby, and things did not work out the way they had hoped. Lore passed away, and Georgia carried Lore’s baby girl out of the hospital. Georgia decided to write a song in honor of her sister called “Lore”. Thirty-one years later, Georgia received a guestbook entry on her website. There, in bold letters read the name LORE. In this new Lore’s comments, she asked why Georgia wrote the song “Lore”. Sixteen year old Lore said that she had been searching Google to find out what her name meant and came across the song. She said she listened to it and was curious as to the story behind it. Georgia emailed her back and just like that, there was a new "Lore" in her life. Her new “Lore” was sixteen and lived in Belgium, and they have become close friends. Lore, her mother, and brother visited Georgia in Florida. For two weeks, Georgia couldn't help but think that life has a strange way of working out, and this new Lore helped Georgia realize how much the “power of one song” has. Germond started her career in Nashville with the first song she ever wrote with her sister, who later passed away in in 1975. Her sister, Lore, wrote the lyrics and named it “Rainy Heart”. Germond headed down to Nashville to pitch the song they wrote together. She immediately felt at home and stayed. She became a studio musician, staff writer, repertoire specialist, composer/arranger, and became “Miss G” to her students at Miss G’s Music School. During this time her teaching and songwriting career took off. Miss G’s 18 years in Nashville involved all areas of musical creation and production. With thousands of songs written, published and unpublished, she knows what the listening audience enjoys. Georgia constantly received calls with requests to teach preschool children. She looked for a program that would be appropriate for preschoolers; however, no such program existed. Most piano teachers refuse to take on children younger than 7. And so Little House of Music was born. Germond named the program Little House of Music (LHOM) because she wanted to turn music into what children know best: home. Throughout writing LHOM, Germond remembered and was inspired by a picture in Reader’s Digest called “It Was Just an Idea”. The image portrays an idea as a bright light bulb, but as time goes on, the bright light progressively dims until it burns out to darkness. “Turning [your idea] off is much easier than keeping it lit”, but the rewards of your light are unparalled. This picture kept her ideas flowing and encouraged her to never give up on her dream. After a year of writing, editing, and brainstorming, Little House of Music Level 1 was published in 1985 by J Aaron Brown and Associates 16th Ave, Nashville, TN. 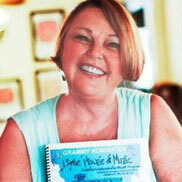 In 1992, Germond purchased Little House of Music from her publisher, J Aaron Brown. Now, after years of teaching little fingers to play the piano, her greatest desire is to share this program with children around the world and make the joys of learning and expressing themselves through music available. She cherishes nothing more than children's smiles and laughter, eagerness to learn, and their capacity to have fun. In 1988, Nelson Wheeler gave Germond the rights to his poem “The Piano Teacher” to use in Little House of Music. Wheeler has been a successful agent for musical subjects all his life. Wheeler, good friend of Germond, became her agent in 2015 and is helping Germond stream Little House of Music to children all around the world! “Little House of Music” (LHOM) is a development company with a primary focus on the children’s musical education and entertainment market. The LHOM brand stands for trust and quality; therefore, it is a well developed, tested, and proven multi-level musical instruction program for children ages 4 to 10. The original music in level one was nominated above 200 other submissions for a Grammy in the Best Children’s Album category in 2002. The children have continually shown that they want to sing, listen and dance to over 120 original songs in the program even when not taking a lesson. The student manual is a comprehensive learning book that reinforces musical concepts from each lesson with fun activities. The student colors instruments, notes, musical terms, and the characters as the program progresses. Students easily learn their way around the keyboard and eventually progress to the piano. Although the program focuses on the piano, the lessons learned are the basis for all musical endeavors. The accompanying streaming animation script, which will be found on LHOM’s website, is ready to be produced and enhances the learning process for children and their families. The loveable and mischievous “Little Mr. Music Mouse” learns LHOM along with the children. Each child is taught by Mr. Music Mouse’s LHOM friends as they enjoy each lesson. The story line teaches more than the important basics of music. In addition, students learn about geography, other musical cultures, and values such as respect for parents, self-esteem, confidence, friendship, and staying drug free. The story and characters show that it is alright to make a mistake and continually inspires children to go on to success. Germond successfully introduced and taught the Little House of Music program in the seven-school system of Murfreesboro, TN. Germond, and her students, appeared on national television singing the theme song of Little House of Music “I’m Drug Free”. Continued personal appearances throughout the Nashville area to standing room audiences contributed to LHOM’s success. Little House of Music in Satellite Beach began in much the same way as it did in Tennessee. Germond received calls from parents to teach their younger children. She taught this revolutionary program out of her own studio called “Little House of Music”. Little House of Music is an extremely special program. This program is specifically written for preschool age children. It is taught on the piano keyboard because it is the only instrument that covers all the bases. When a student learns piano theory, he/she is learning rhythm, timing, dynamics, and note reading. The program is extremely hands on and has students use three of the five senses (sight, sound, and touch). Another benefit is that it saves time and can encourage family time. Often, when a student takes music lessons, the parents are required to drive them to the lesson and wait until it’s over. However, now Little House of Music can be learned in everyone’s living room. The audio CDs (2 per level) and online animations are easy for a parent to follow and learn at the same time. Statistically, 70 percent of adults wish they would have learned music as a child. LHOM offers this opportunity. Levels 1-3 will be streaming animations through the Little House of Music website, so children can learn all over the world! Once students start playing songs from Levels 1-3, they progress to Levels 4-6 which offer more videos and books. The online component of this program will allow students to have audio access to the songs, as well as seeing the song being played. This multimedia hands-on experience will help students train their musical ears, learn proper hand and finger placements, timing, dynamics, and much more music theory. Little House of Music aims not to interrupt the piano teaching business, but to prepare future students for lessons. After 60 lessons (Levels 1-6), a LHOM student will know the music theory of a student with approximately 3 years of formal education before he/she even begins actual lessons for the instrument of their choice, not necessarily piano. Considering that children learn half of their life’s knowledge between ages 4-8, LHOM is a tremendous opportunity for students to be introduced to the world of music and retain the information. The arts are constantly being cut from education in our children’s school systems, and Little House of Music is a way to keep music in our youth’s lives. LHOM is even proven to affectively teach music to children with disabilities and autism. It is an extremely affective music education program and teaches students music “THE FUN WAY” (Germond). Germond with her Student of the Year, Wesley. Wesley began taking Little House of Music lessons with Germond at the age of 4 and then continued on with private music lessons. 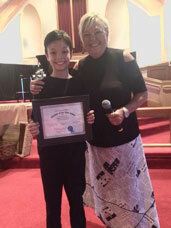 He is now 10 and is pictured after performing five different instruments at LHOM’s “MUSIC PARTY” in April 2016. Germond considers Wesley, and all her students, her children. Germond has written over 5,000 songs in her life and continues to create. Especially For You at Christmas: Produced and recorded “Especially For You at Christmas” in conjunction with the Tennessee School system to benefit “latch key children” program. Two Octaves of Kids: 16 original compositions composed and written by Georgia Germond’s students. Germond produced and directed this album. 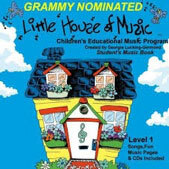 Little House of Music: Revolutionary music education program for pre-school age students. Dancing 4 O’Clocks: Named after the flower, the CD contains 11 original relaxation piano instrumentals composed and recorded by Georgia Germond. Whimsical Music Story: Germond’s spoken word album tells the story line of Little House of Music. That’s My Florida: Georgia’s inspiration sparked when she heard Florida's state song, Swannee River, by Stephen Foster, which was written in 1851. What you might not know is that Stephen Foster never visited Florida and portrays it as a bleak place with lyrics such as "sadly I roam" and "all the world is sad and dreary” which in the 1800 was true. This song was even used in some black-face musicals with lyrics referencing slavery. The term “darkies” was removed only 10 years ago from the song! Germond was and is convinced that Florida, her paradise, needed a new state song, so she wrote one. 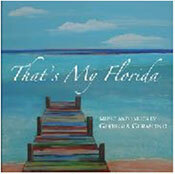 Germond’s song began as a poem, “There’s a Place Called Florida” (2010). This poem is now hanging in the People’s House in Florida. She is extremely passionate and appreciative of her home and wishes to share this with the world. From there, she adapted her poem into a spoken word narrative, narrated by Cindi Griffin. From there, Germond adapted this to become a pop song, "That's My Florida". This song is the perfect solution to the state song issue. This upbeat tune demonstrates the vibrant and welcoming atmosphere of Florida. Germond is hoping to make this song more well-known by introducing it to school music programs. She has been in contact with representatives from every corner, including the Govenor of Florida to make this dream a reality. To support her initiative, sign her petition at the following link. She was featured in Brevard Live Magazine in August 2016 for her dedication and ambition in changing the Florida state song. All Around the World at One Time (spoken word): Selected to be featured on the United Nation’s Peace Project “Action Moves People United” album (2016). This song is also on the ballet for the 59th Grammy Awards. Germond wrote the lyrics, which was spoken by Cindy Griffin. It was then sung and arranged by Lonnie Park, who studios are in New York and is a long time member of the Grammys. Survivor the Sea Turtle: (2000) A true story based on a baby sea turtle that Germond and Jeanne Thomas saw while walking on the beach. 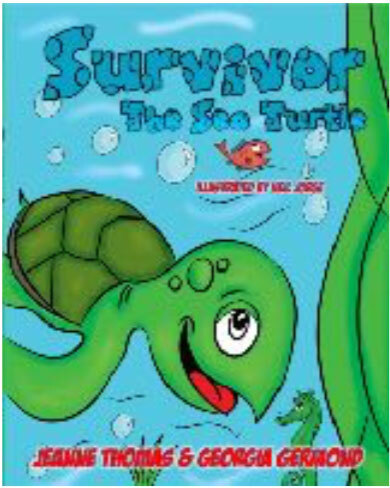 This is a children’s book has an emphasis on education about the environment and proper care of sea turtles, an endangered species. Germond has two children and four grandchildren that she loves very much. She is “fortunate to have a lot of people who believe in [her]” (Germond). She enjoys working in the yard and picking up trash while she walks on the beach. This lamp is made of the trash she cleaned off the beach to demonstrate that is our responsibility to keep our oceans clean. She is a peace advocate, environmentalist, and protector of children and animal. This can be seen in her works. One notable project, is her initiative to start a screening process for music teachers. There are no regulations in place for private music teachers who do not teach in the school system. She wants all children to be safe. Copyright ©1993-2008 · LittleHouseofMusic.comTM · All Rights Reserved.